Julian Mannix. Photo: Alex Pacheco. Peter Brant. Photo: Alex Pacheco. WELLINGTON, Fla. - Feb. 7, 2016 - It almost looked like two different games were on the card when White Birch Farm faced Audi/Millarville in the 20-goal Ylvisaker Cup at the International Polo Club Palm Beach (IPC). Through the fourth chukker it was an evenly matched contest, ending with the score 8-all. Then things went awry for Audi/Millarville in the last two chukkers. Ezequiel Ferrario and Mariano Aguerre scored seven unanswered goals in the fifth, pushing on to win the game for their team 16-9 over Audi/Millarville. But for an astounding goal by Team USPA member Grant Ganzi, Audi/Millarville was at a standstill in the last two chukkers, which were predominantly 4-on-3 scenario, with two of its players benched for a chukker (Nic Roldan in the fifth; Julian Mannix in the sixth). Each had drawn two yellow cards in the match, which under the 2016 International Rules sends a player out for the remainder of the chukker.White Birch's much-anticipated appearance in the 2016 Florida season came after a multi-year hiatus. (With a somewhat different lineup, White Birch won the 2005 U.S. Open at IPC.) "We've never played as a team together, but it's fun. I'm glad to be back here with these great players," said patron Peter Brant, a former 7-goaler. Peter entered his team in the Ylvisaker Cup in preparation for the upcoming 26 goal tournament series. "All of the teams are really good. I don't think anyone will have an easy go of it; you can lose any game you play. Of all the years I played here, this is maybe one of the toughest for the 26 goal series because even though there are only eight teams, every one of them is good." Aguerre nodded, adding that White Birch came determined to win and had been preparing for the 26-goal series, in which it is also entered, for the last year-and-a-half. 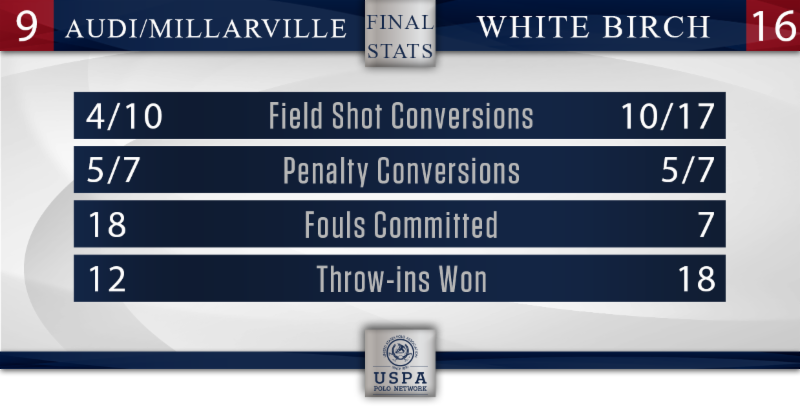 The game was live streamed by ChukkerTV, a partner of the USPA Polo Network. Continuous live coverage of the Ylvisaker Cup resumes at IPC on Sunday, Feb. 7, when Horseware/5 Star Builders/Tackeria plays La Indiana at 3 p.m. EDT.